A completely revised edition of the original text entitled Sediment Transport Technology. All chapters have been updated and expanded and contain excellent discussions of the concepts, advantages and disadvantages of various types of mathematical models. This text is now supported by a Solutions Manual which effectively supports the text and includes many new, practical problems. Following is a brief summary of each chapter. Chapter 1 is an historical background related to the development of sediment transport, channel stability, and river mechanics. Chapter 2 helps to bridge the gap between the application of numerical relationships and the physical processes within which engineers and ecologists must work as a team. Chapter 3 includes all of the fundamental concepts from fluid mechanics and hydraulics essential to the analysis of water resources, environmental and related areas involving hydraulics. 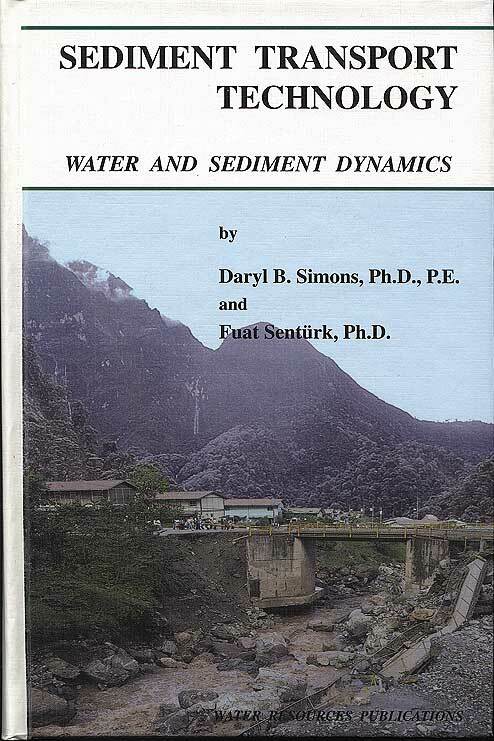 Chapter 4 clearly delineates and explains methods of sampling and analysis of sediment, analysis and the development of pertinent variables related to sediment transport and channel stability. Chapter 5 and 6 present in a detailed, practical and concise way, a complete evaluation of forms of bed roughness for all forms of open channels with particular emphasis and explanation of alluvial channels and methods of assigning resistance coefficients for this wide array of types of roughness elements encountered in hydraulic engineering. Conditions discussed range from alluvial channels with parameters formed of clay, silt, and sand to steep cobble and boulder bed streams. Chapter 7 realizes that the concept of the initiation of motion is closely related to sediment transport theories, channel stabilization, the design of stable channels, the development and utilization of sediment excluders and ejectors, and of course, is closely related to many fisheries and related biological problems where the biosystem must be considered. Chapter 8 begins an explanation and emphasis of the concept of three levels of analysis, dependent on the type and complexity of the problem. In dealing with fluvial systems, it is necessary to determine the rate of water discharge and the sediment supply from the upstream watershed in order to properly evaluate and design components of the total system. Chapter 9 develops a wide array of accepted transport relationships and applies them to a variety of settings while clearly delineating the limitations of such relationships. It is presented in a realistic and practical manner. Chapter 10 places considerable emphasis upon the evaluation of contractions imposed by bridges, the scour around bridge abutments and bridge piers, degradation downstream of all sorts of structures that impose hydraulic changes upon the flow of water and sediment. Chapter 10 Degradation, Aggradation and Local Scour in Alluvial Channels ISBN - 0-918334-67-5.